That is how this writer sees the signing of this even more bigger government budget busting spending bill. It is damn if you do and even more damned if you don’t. And, there is one thing for sure if the bill is not signed the liberals will be practically guaranteed of winning the U.S. house and maybe even the U.S. senate. This writer knows it will never happen, but if the republicans had the wisdom as I see it they would after the budget bill is signed repeal the 1938 socialist minimum wage law. 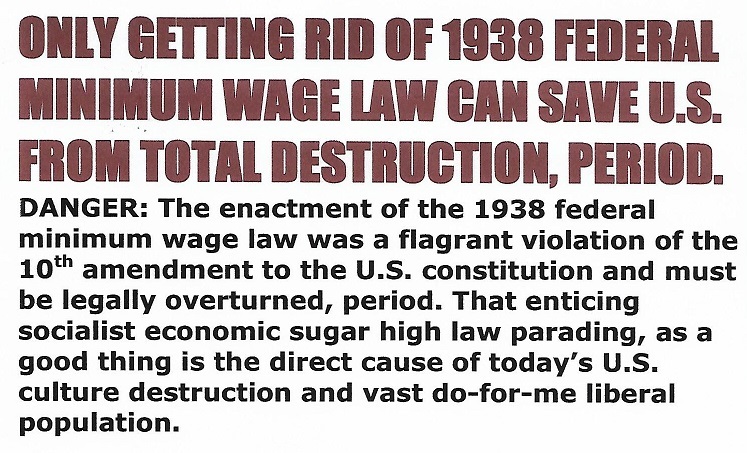 Repealing the 1938 socialist minimum wage law is the only thing that is powerful enough to provide the necessary societal discipline to prevent insane extreme liberalism from eventually over powering all common sense and sound judgment in the USA. FREDDIE LEE SIRMANS LOG: 23 MARCH 2018, 1330 HOURS.